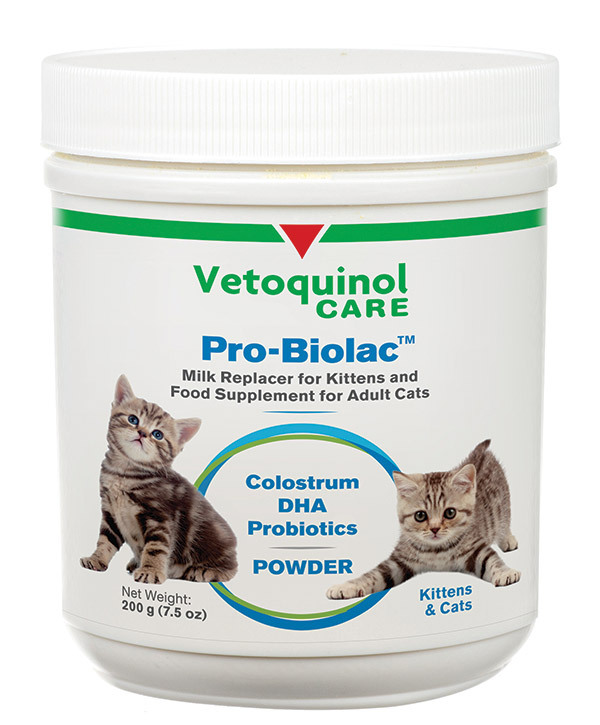 Pro-Biolac is a nutritionally complete milk replacer which can be used when mother’s milk production is inadequate. 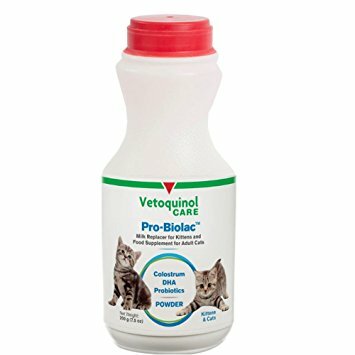 Pro-Biolac can also be used as food for orphan kittens. Whenever possible, kittens should receive colostrum (first milk) for the first 2 days, since this supplies antibodies essential to disease resistance in early life. DIRECTIONS FOR MIXING: To make 8 fl. oz, add warm water halfway to fill line above. Shake well. Then fill all the way to fill line with warm water and shake until all powder is dissolved. Refrigerate after mixing. Discard if not used within 24 hours after mixing. To mix less than 8 oz of formula, add 2 parts powder to 3 parts warm water and mix until all powder is dissolved. DIRECTIONS FOR FEEDING: Feed reconstituted formula at body temperature. Use of a nurser bottle is recommended. Feed kittens at least 2 tablespoons (30 ml) per 4 ounces (113 g) of body weight daily. Divide the daily feeding amount into equal portions for each feeding. For the first 4 days of feeding Pro-Biolac the daily amount should be divided into 6 to 8 feedings. The number of feedings can then be gradually reduced to 4 per day (dividing the daily volumes into 4 equal parts). Kittens should be allowed to consume as much formula as they want during each feeding. Increase or decrease the amount fed based on the individual needs of each kitten. If diarrhea develops, consult your veterinarian for advice. Always wash feeding and mixing utensils with hot soapy water, rinse well, and dry after each use. Pregnant and Lactating Queens: Feed 2 reconstituted teaspoons (4 g) per 5 lbs. (2.2 kg) body weight daily until 2 weeks after queening.